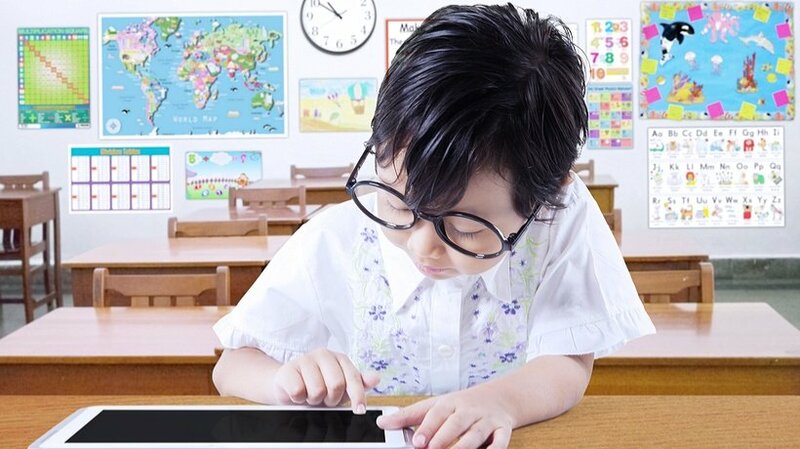 In the list below you will find 15 free must-have iPad apps that will help your children or students practice and learn everything covered in school in an elementary level. Colorful games, stories, and other audiovisual material will keep them busy playing and at the same time learning and revising what they have done in the classroom. The beauty of bookabi is that everything children need to tell their stories are already there – no drawing skills needed. bookabi has a collection of 2D and 3D characters, fanciful backgrounds and fun stickers and objects that you can place, resize and rotate with the swipe of a finger. Children can add speech bubbles, text, and even design the cover. You can also use your own photos as elements of the story or backgrounds (wait 'til you see how your living room looks with a spaceship in it!). Using bookabi’s fun and colourful characters, backgrounds and stickers, it’s easy for kids of almost any age to bring the worlds and fantasies from their imaginations to life. Chirp is a magical new way to share your stuff – using sound. Chirp 'sings' information from one iPhone to another. Share photos, links, notes and more: all from your built-in iPhone speaker. What will you chirp? Chirp lets you send information over the air to anyone running the app near you. Use the app to send or receive pictures from your camera, and share with everyone in the room. Chirp is the super-simple way to share that everyone's talking about - download it now. Reading, even in the digital age, is probably one of the most important skills that children acquire. It can be an important source of pleasure which also develops vital language and social skills. It is fundamental to most school activities; it can also open up new worlds and give access to the wealth of human knowledge. This app that has been developed by child psychologists and other specialists at The Open University enables young children to take part in fun games which can help develop interests and skills that will be relevant to them when they start to read. Rover is an education app and the only education browser for your iPad designed for teachers and students of all ages. Rover is targeted towards enhancing the K-12 education experience, bringing the best online learning content to your iPad- including access to content ordinarily available on the Apple tablet (e.g. Flash content). We have partnered with major education brands to make sure you have access to leading educational content on the iPad. Rover can transform your classroom into a fun, easy to use, and exciting learning lab! VocabularySpellingCity is a fun way to learn spelling and vocabulary words by playing engaging learning games using any word list. The most popular activities are Spelling TestMe, HangMouse, and our vocabulary games, available to Premium Members. The most popular word lists are Sound Alikes, Compound Words, Hunger Games and SAT Words. The free app includes ten of our most popular word lists and eight of our most popular learning games and activities. Spelling TestMe is a spelling test that reads each word aloud, uses it in a sentence, and repeats the word. Students can work at their own pace and receive instant feedback upon submitting the completed test. With Story Creator you can easily create beautiful story books containing photos, videos, text, and audio all in one gorgeous collection. Story Creator truly brings your best stories to life and easily allows you to retell and share your most memorable moments. Story Creator offers a magical way to enjoy your personal pictures, videos, and experiences with family and friends. Socrative brings smart clickers, student response and ease of use to a whole new level. Be engaged for the entire class with educational exercises and games. See all your classmates’ ideas in real time and interact with the responses. Provide your instructor feedback on the lessons and how well you understand the material. Ask your own poll questions for the entire class or build a premade activity for your whole class. Have Fun! Meet Sushi Monster! Scholastic’s new game to practice, reinforce, and extend math fact fluency is completely engaging and appropriately challenging. Strengthen reasoning strategies for whole number addition and multiplication by helping monsters make a target sum or product. Earn points with each correct answer… but watch out for distractions! To be successful, plan ahead and strategically select numbers from the sushi counter. Todo K-2 Math Practice is a series of 6 fun and engaging multi-level games that offer children practice and support in Pre-K through 2nd grade math fluency skills including: counting, writing numerals, addition and subtraction. Developed by award-winning game designers and in collaboration with teachers and math experts, Todo K-2 Math Practice offers meaningful play for students who struggle to master early elementary math. Combining research-based instructional strategies with playful game design helps children who struggle with math understand the meaning of mathematical operations building a strong foundation for further mathematical learning. Lights, Camera, Play! Toontastic is a storytelling and creative learning tool that enables kids to draw, animate, and share their own cartoons with friends and family around the world through simple and fun imaginative play! With over 2 million cartoons created in over 150 countries, parents and teachers rave about the app... and kids can't stop creating! Making cartoons with Toontastic is as easy as putting on a puppet show - simply press the record button, move your characters onscreen, and tell your story. Toontastic records your animation and voice as a cartoon video to share with friends and family on ToonTube, the app's global storytelling network for kids. I have provided a virtual set of fraction bars on www.abcya.com for several years. Many teachers have contacted me about creating a similar application for the iPad. Here it is! I offer this app for free because virtual manipulatives alone do not provide meaning for learners; they require a teacher to guide meaning and connections.